I’ve made several checkerboard baby quilts in the past and have so many people ask me for patterns, that I finally made another quilt and spent some time making up a pattern. In the past, I have made these checkerboard quilts using a traditional 16-patch block but I’ve thought about it and feel that sewing width of fabric strips together and then subcutting them is faster. 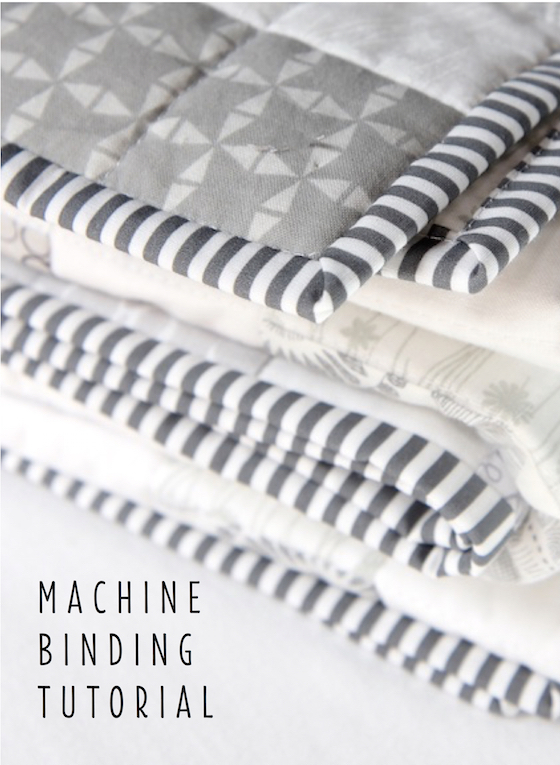 So this pattern utilizes a super easy and quick strip piecing method. * The pattern to make this quilt is now available in my Shop. The little lamb fabric is called Clover from Cotton + Steel. It’s so sweet! I selected my favorite dot fabric from Art Gallery Fabrics called Firefly in Whisper from the Hello Bear collection. I added a Moda Solid and a little bit of a check fabric from Camelot called Mixology Woven in Rainwater. For the backing, I found a fabric I thought went so well with the top – it’s called Scattered Hashtags from Moda Mixology. For the batting, I used a low loft Warm and Natural 100% cotton. I quilted it with Aurifil thread, using a 4.0 stitch length and a walking foot. I just used the seams on each square as my guide. For the binding, I used Squared Elements in Turquoise. I machine stitched the binding using my usual method. 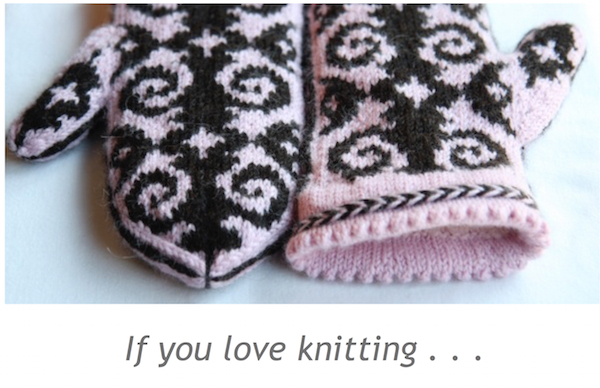 I have this pattern out to testers right now and when I have it available very soon, I will announce it here on the blog and it will be available for purchase. If you follow me on Instagram, you will see it there also. 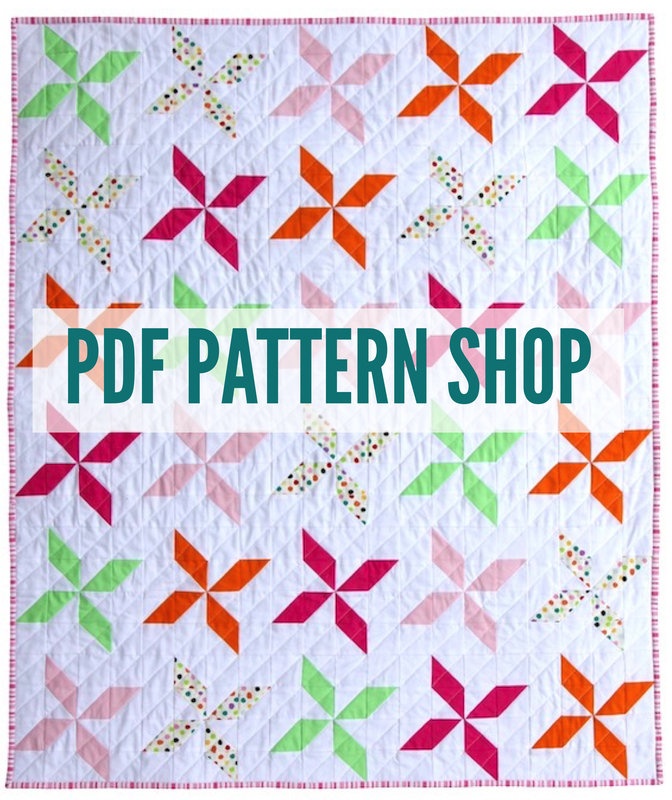 I will be very happy to finally be able to provide you with a pattern for this simple, fun quilt. This quilt itself is now listed in the Shop. 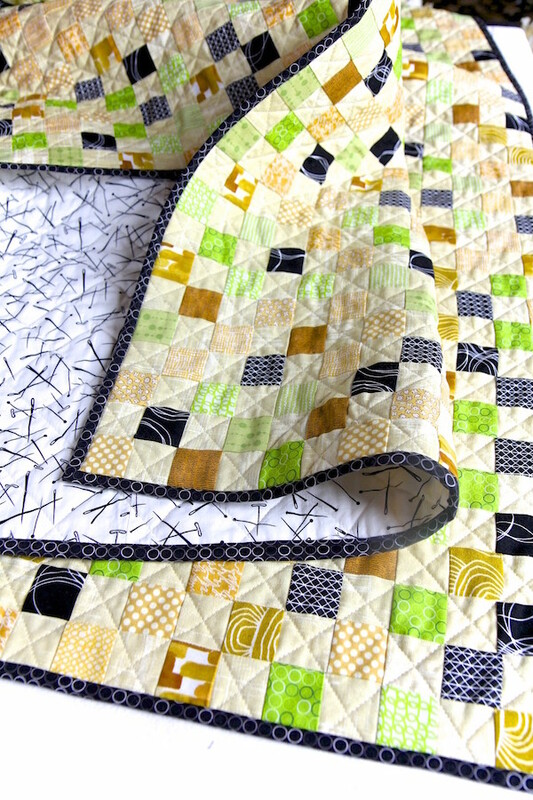 ** A pattern to make this kind of quilt is now available in my Shop. 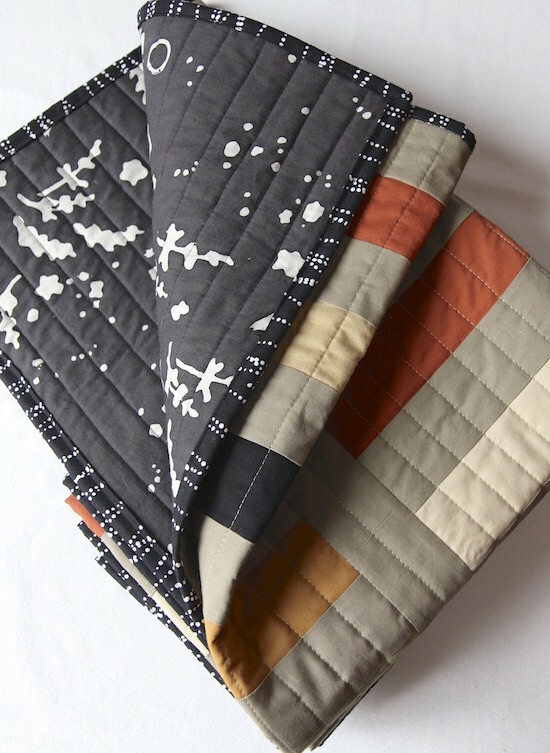 This entry was posted in baby, finished quilts on March 14, 2018 by Beech Tree Lane Handmade. It is just adorable. Love everything about it. Yes, less is more and I try to apply that to my baby quilts. I love your quilts. They are stunning! 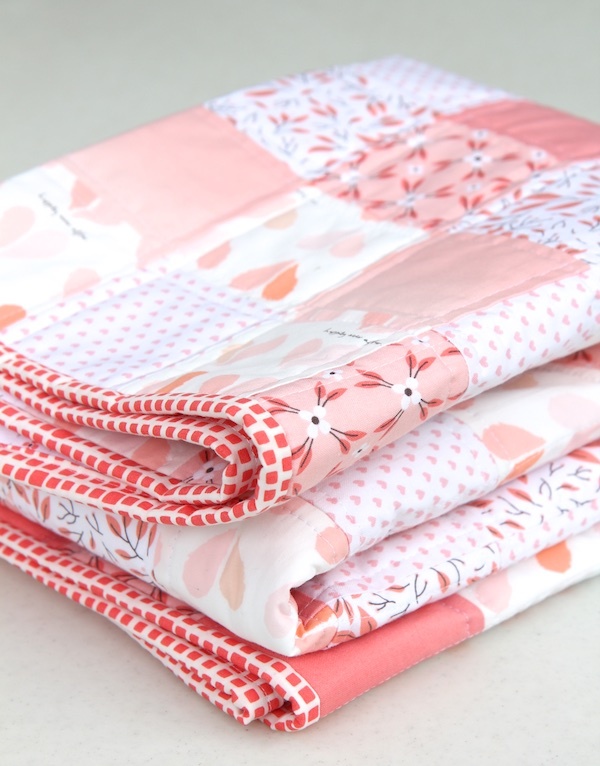 Please can you tell me where to find the fabric for this quilt! I am going bananas trying to figure out each fabric. 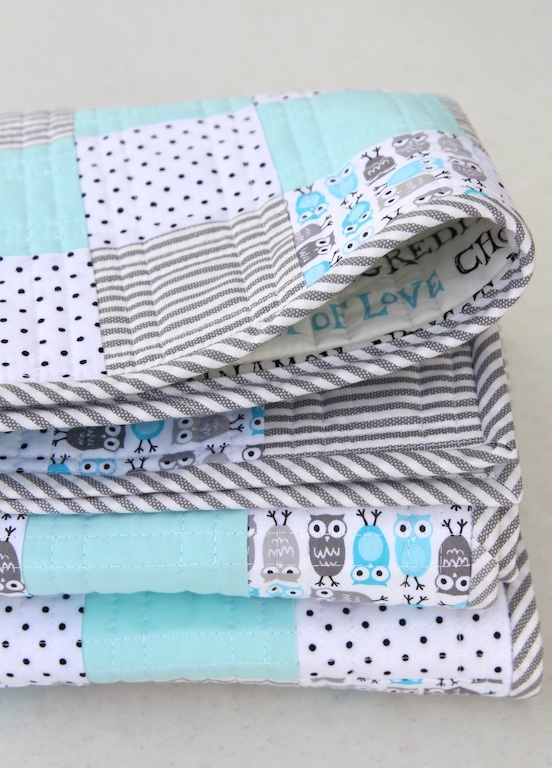 I especially love the other Quilt you made with the owls and the backing of “Key Ingredients” by Alexander Henry, but I simply can’t find it! Any help would be fantastic! This is lovely. I love the aqua colour and fabrics looks so good together. I adore that little lamb print. Just perfect for a baby quilt. Hi Elaine. 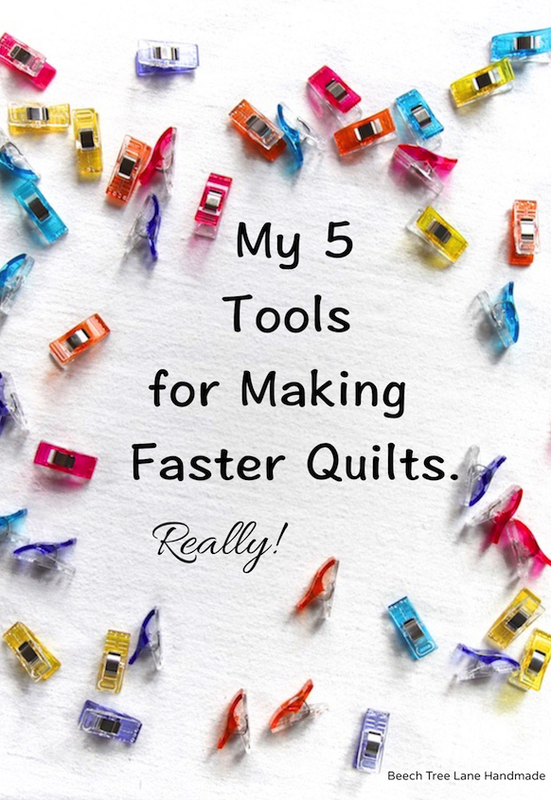 I’m a big fan of everything you do as you are a Jill of All Trades ☺️👍🏼 Just wondering if you had any rule of thumb when picking fabrics for a quilt. I’m talking yardage. For example, do you always get fat quarters of prints or 1/2 yard ? When building your “stash” I mean. Quite often I fall in love with a line and never get it for fear of having too much or too little. Thanks for your tips and tricks… so appreciated. I admire you using “Jill” of all trades, but did you know that the term “rule of thumb” refers to the size of willow branch – size of thumb, to strike a woman with. It’s a familiar phrase that I’d like see removed from everyday speech. I love the quilt too. 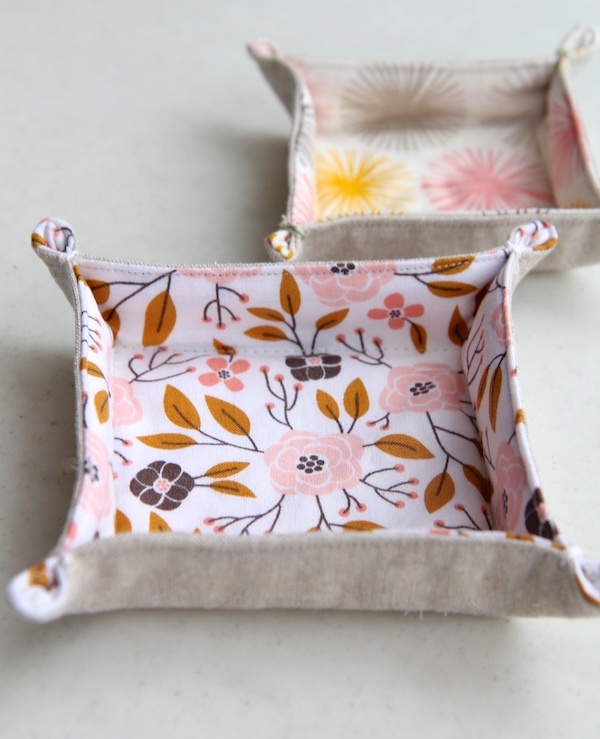 AnnieVee: I rarely buy fat quarters. I like to work with WOF. I often buy 1/2 yards of something I like to add to my stash. If I seeing a good binding fabric, I buy a 1/2 yard. That will bind a throw size quilt, which is the largest I usually make. If I find a fabric that absolutely knocks my socks off, I will buy a yard! Hope this helps. Oh my gosh! I love your quilts! You said that you are going to post pattern soon. But I love this lamb, could you please tell me how much fabric to buy of each fabric? Thank you so much! Robin: You will need a 1/2 yard of each of the 4 fabrics for the top. Hope this helps. Pattern is just about ready! How big are the squares? They are 3″ after being sewn in. How big are your strips 5 inches. 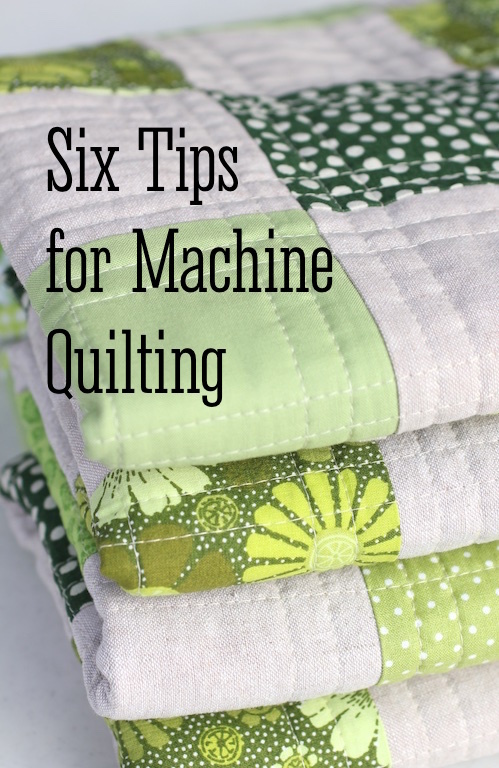 Do you use 40wt or 50wt thread on top when machine quilting? Thank you. Toby: If if have the color I want to quilt with in 40 wt, I use that. I do prefer the look of a little bit heavier thread. I will also use that in the bobbin. If I don’t have 40wt in the color I want, I use 50 wt. Hope this helps. Love the quilts! How big us this quilt? That’s so awesome, Patricia! I do love my Janome Skyline machine – it sews beautifully. You can also send me a photo via my email if you would like! (see my contact info in the “About” tab). Would love to see it. Hi, I’m just starting making some baby quilts. My aunt embroiders cute old fashioned type children on squares and then I cut the strips to sew in between the squares. 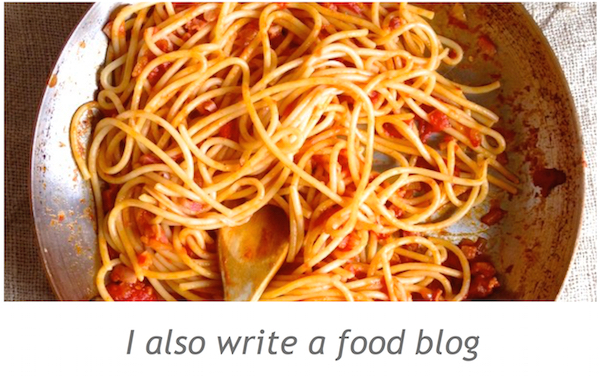 I’ve found a lot of helpful tips on your site. However, on the first quilt I used a water soluble marker to label the strips and it didn’t wash out!☹️ Do you have any ideas of what I could treat it with to get it to wash out? I’ve tried…..hair spray, Murphy’s oil soap, Dawn dish soap, hydrogen peroxide, Tea Tree Oil. Needless to say that pen is going in the trash! Terri: Wow – so sorry that happened to you. I have no idea other than the things you already tried. Did you let it soak for a good long time in water? What brand of pen was it? I’ve never had that happen! OK! We finally got it out! My daughter in law told me about a homemade stain remover that she uses on her kids’ clothes. A 50/50 mixture of hydrogen peroxide and Dawn dish soap in a spray bottle. We saturated the spots and let it sit over night and laundered the quilt and let it air dry. We had to do that routine twice, but the marker stain is completely gone. There is no faded spots on the quilt after all that treatment and scrubbing. Terri: Thanks for sharing this tip! I still can’t believe that “washable” marker was so stubborn! I made two quilts a year ago i. February for my daughters baby shower. Two because she was having twins. I love every time I visit and they play on them as well as every time I see the quilt in the background of a picture. I’d love to share a photo with you. Kelly: I would love to see a photo of those quilts! My email is in my “About” page. Please send!